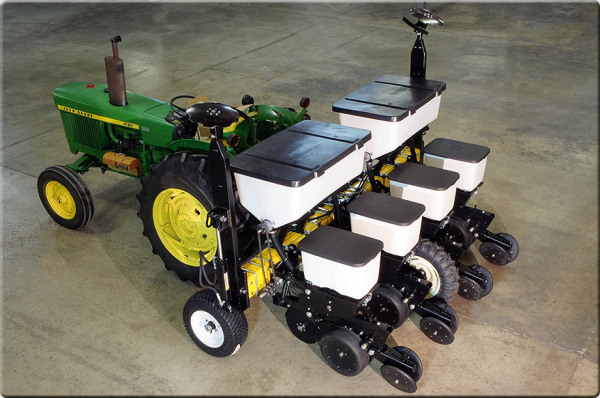 A-M-E is a premier manufacturer of agricultural planters with an emphasis on choice, performance, and quality. With 7 different base models that can be configured in 72 different ways, A-M-E is proud to offer real choice so the customer gets what they want not what is only available on the dealer's lot. A-M-E offers top performance seed meters with 99% accuracy at high speed; along with variable seed rate and many other enhancing features for precision agriculture. In our 140,000 square foot factories, each machine undergoes our detailed standard operating process in assembly, configuration, and quality testing. To insure a successful planting season and provide "peace of mind", A-M-E ships with each machine a complimentary care package consisting of some key components and parts. A-M-E is so confident in our process and workmanship, that we offer a one season parts warranty on our machines. A-M-E listens to you, our client, and we endeavor to give you all the features and accessories you require. We have no preference to a color, row spacing, or accesories; we just emphasize performance at a reasonable cost. A-M-E hopes to earn your business by enhancing your profits. Every unit passes a rigorous testing and quality control inspection so we can offer you, with confidence, the reliability you deserve. Our machines are engineered right and built tough in the USA heartland. A-M-E understands that these machines are production tools and their sole purpose is reliable performance complemented with accuracy. A-M-E can offer all of this to you at competitive pricing providing less expenses and more profits for the season.